Fast and practical high resolution separation and quantitation of charged and polar analytes. The P/ACE Series is an automated, programmable capillary electrophoresis system designed to perform fast separations from complex samples. Separations occur in a capillary which is housed in an interchangeable cartridge with circulating liquid coolant for efficient temperature control. This finely regulated temperature control allows the use of high ionic strength buffers and large-bore capillaries necessary for analyzing difficult samples. With CE, methods are faster to develop, easier to validate, and less expensive to run. Note that different detectors are available to optimize performance for your application. For every researcher there is an ideal analytical technology—one that helps you achieve your goals. The system includes a selectable-wavelength high sensitivity modular UV/Vis detector (includes 200, 214, 230 and 254 nm filters to optimize analyte specificity), UV source optics, temperature-controlled sample storage module and 32 Karat™ Software configured on a desktop controller. Installation Qualification, Operation Qualification 1 (OQ1) and documentation to aid in software validation is also included. 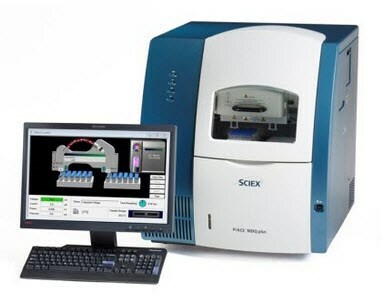 There are no threads in SCIEX P/ACE™ MDQ Plus Reviews at this time.